Various fixings are used for holding the thatch to the roof. Some thatchers still crook to timbers, the drawback to crooks are that there is potential to split rafters and the result is stress placed on the roof structure. The “banging,” also causes damage to ceilings in some cases. They are not recommended for a system with solid fireboards. Thatchers have moved on to using stainless steel screws and wires with the metal rod. The screw fixes into the battens causing less stress to timbers than crooks. Spars are used when the roof is stripped to a firm foundation. Both plastic and wood spars are used as fixings for coatwork. Wooden spars of Hazel or Willow are used to hold on coatwork and for ridging. They are also used with liggers to form patterns on some Longstraw and Combed Wheat Reed. Click here to see a video of a sparmaker making thatching spars. Bamboo and other woods e.g. Ash are sometimes used as horizontal liggers. 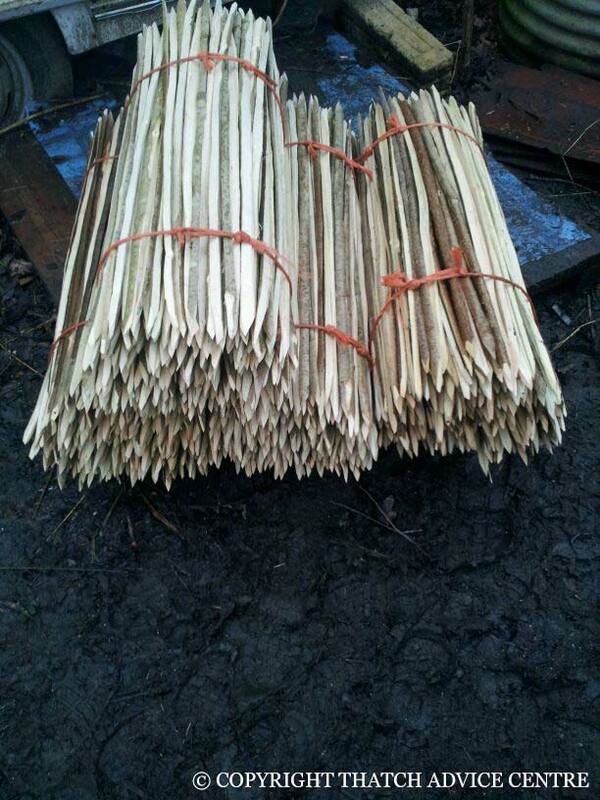 Spars are produced straight but often now imported ready twisted. Twisting a spar is a technique mastered by thatchers usually when in training and is not as easy as it looks. The spar must be twisted not broken! Spar making used to be done by thatchers but this trade is now more specialised e.g. coppicing groups. Pin wire bent into a U shape or spars is used to fix wire netting down, it is also stapled to the arris rail or fascia under the eave. If you need any more information or a more detailed explanation of anything please contact us.